Before the 2017 National Electric Code (NEC), two items could not be used as part of the grounding electrode system for structures. These items were and still are metal underground gas piping systems and aluminum materials. The 2017 NEC introduced another item to this list. This item is the structure or structural reinforcing steel described in 680.26(B)(1) and (B)(2) for permanently installed in-ground swimming pools. Figure 1. 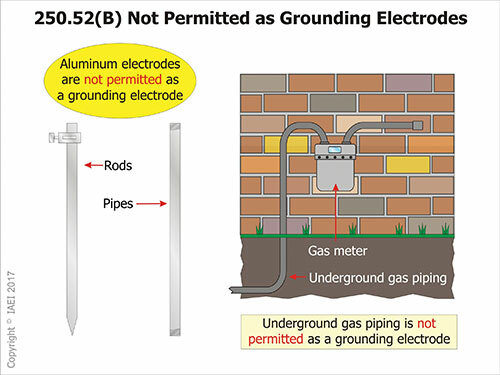 Items not permitted as grounding electrodes before the 2017 NEC. Detached buildings or structures with electrical power from a feeder—such as detached garages, workshops, etc.—require that a grounding electrode system be established and installed in accordance with the requirements of 250.32(A). Occasionally, these detached structures are located near in-ground permanently installed swimming pools. When this situation occurs, it has been documented that in some areas of the country, the electrical installer will sometimes run a grounding electrode conductor from the electrical subpanel at the detached structure to the reinforcing steel of the conductive pool shell (belly steel) or to the structural steel of the perimeter surfaces (deck steel) with the intent to identify the pool reinforcing steel as an “other local metal underground system or structure” as described at 250.52(A)(8). Photo 2. The swimming pool conductive pool shell (belly steel) prior to the installation of concrete. Unfortunately, this action was sometimes at the request of the local authority having jurisdiction (AHJ). Some in the inspection community see this connection as being similar to that of making a connection to a concrete-encased electrode located in the footing of a structure. By making a connection in this fashion, this would make the swimming pool (and possibly its users) a “super-target” for any stray currents or ground-fault current introduced on this grounding electrode system. This could potentially introduce safety hazards to the occupants of the pool during events such as lightning strike-induced stray currents. 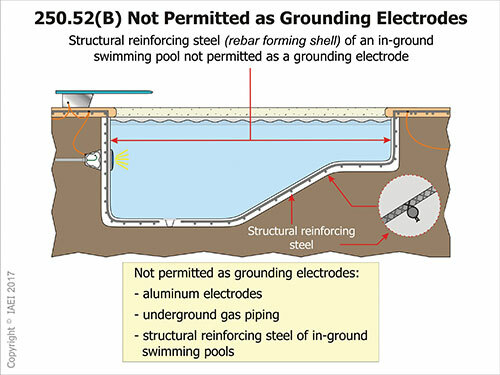 For the 2017 NEC cycle, language was added at 250.52(B) to prohibit the use of the structure and structural reinforcing steel of an in-ground swimming pool from being used as a grounding electrode in the manner described above. Information describing the installation of the equipotential bonding requirements for swimming pools can be found in 680.26(B)(1) and (B)(2). Members of Code Making Panel-5 (CMP-5) determined that it was never the intent of the NEC to use a pool bonding grid as a grounding electrode. 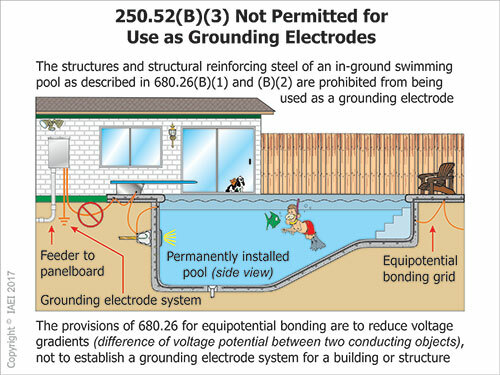 Adding the extra requirement to prohibit the use of the metal components of an in-ground swimming pool is an important clarification to point out the difference between grounding and bonding. The equipotential bonding requirements of 680.26 are to reduce voltage gradients (difference of voltage potential between two conducting objects), and not to create a grounding electrode system for a building or structure. Figure 2. This illustration lists the three items for the 2017 NEC that cannot be used as part of the grounding electrode system. 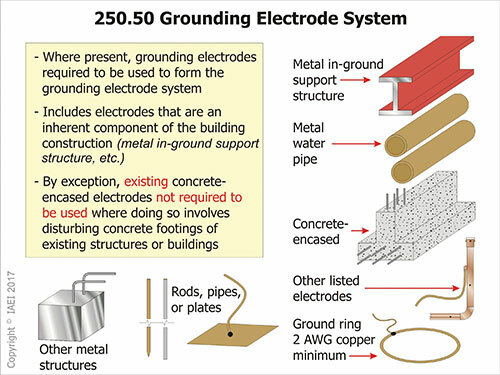 In the 2005 NEC, the phrase “if available” was replaced with “where present” at 250.50 to indicate that all grounding electrodes that are “present” on the jobsite must be used in the grounding electrode system. This was done to make this section consistent with the NEC Style Manual. This change also helped to correct an issue that in some cases seemed to be vague or unenforceable. Again, this helped installers and inspectors understand that any of the grounding electrodes that were present at the structure were and are to be used as part of the grounding electrode system. This includes the concrete-encased electrode that in some cases was being installed and covered with concrete prior to being utilized as part of the grounding electrode system. The NEC contains a list of electrodes that must be used where present. All of the grounding electrodes described at 250.52(A)(1) through (A)(7) shall be bonded together to form this grounding electrode system (see Figure 4). In the 2017 NEC, clarification was brought forward by CMP-5 that this did not include the steel reinforcement of an in-ground permanently installed swimming pool. The following illustrations (Figures 2 and 3) contain information pertaining to the belly steel of swimming pools. Figure 3. This illustration shows a second building next to a swimming pool which has a feeder panel installed for the electrical system to the additional building and the pool equipment. A grounding electrode must be established, but it cannot be to the structural reinforcing steel of the swimming pool. It is the intent of both the electrical installer and inspector to provide an electrical system that is safe for the customer and public at large. Many times, situations arise that require additional guidance from the authorities and experts. 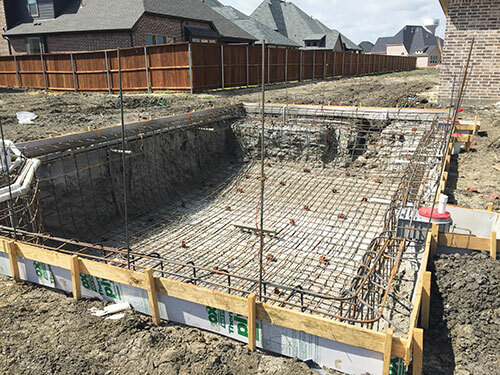 In this case, the authorities and experts from CMP-5 received a public input(s) asking for clarification to the connection of the structural steel of in-ground permanently installed swimming pools as part of the grounding electrode system. Their conclusion was that this should not be done, thus resulting in another item that is not to be used as part of the grounding electrode system. The intent of this article is to provide the reader with useable information that will help when this situation arises. If you are unsure about the specific requirements concerning grounding and bonding, a good resource is the Soares Grounding and Bonding book from the IAEI. This book includes many easy to understand illustrations and interprets complex Code language into layman terms. Figure 4. This illustration shows the items that, when present, must be used as part of the grounding electrode system at a structure. Another good resource for information regarding in-ground permanently installed swimming pools is IAEI’s One- and Two-Family Dwelling Electrical Systems book. This book includes the same quality of illustrations that you can reference as needed to make sure this critical environment is installed or inspected in a competent manner. With this article and the resources mentioned above, you should feel more comfortable and knowledgeable installing or inspecting these systems. If you are an installer or an inspector, you are the “first preventers” in maintaining an electrically safe environment. Next articleIAEI Magazine: Call for Writers!